Today the roommates and I took a drive to eastern mass for a workshop and found ourselves with hours to spare upon our arrival. As we followed the GPS to our destination Ashley noticed a sprawling cemetery that surrounded us on either side of the road and suggested we take a walk through to kill some time. It had been a nice day, but by this time clouds were rolling in, the wind was picking up and the last thing I wanted to do was spend time walking through some random cemetery. The last time I had been in a cemetery was the day after Kai’s ‘wake’. I vetoed her request instantly but as things typically go when Ashley, Joe and I are together we started a healthy debate exploring each of our complex, and sometimes confused, feelings on cemeteries. None of us are religious and we have had this cemetery debate many times in our lives, of course most recently and importantly when trying to figure out what to do for Kai. Growing up I took a stance against cemeteries sighting that they seemed, to me, to be a wasteful use of the earth’s precious land. As Kai was dying I considered the dedication of this land in a different way. Driving through those frozen cemeteries in November 2012, with an urn full of my baby’s ashes, the decline of the earths natural habitat felt like a distant and impossible problem to concern myself with. My mind that day was small and singular, only able to consider the precious life of my one and only son. The vast world was closing in around me and I wanted so badly to just feel something in those cemeteries that day. Something that told me it would be ok to bury his ashes, to lay him down to rest. With every turn down the next tiny empty cemetery road I begged for some guiding light that would tell me “This is the spot”. I so badly wanted a spot in the world just for Kai where everyone, anyone could visit him, honor him – see that once he was alive. At the same time the thought of visiting Kai at some cold and lonely cemetery filled me with dread. I could not stand the thought of having him so far away from me. 12/3/12 I don’t want it come here to remember Kai. I don’t want to sit here surrounded by shiny stones of people I don’t know, with my little baby under the earth trapped in an urn glued shut. I don’t believe in cemeteries I never have. 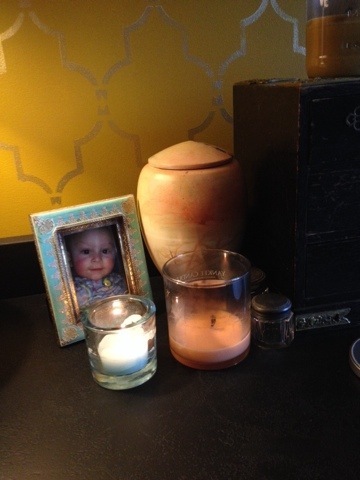 Kai’s ashes remain centered atop my black metal dresser, tucked between a collection of candles and photos, a tiny shrine. I had not thought about the cemeteries again until today. As we drove past the cemetery, in my protest, I began to feel something familiar about this road, this view. After dinner, still with plenty of time to spare, we drove past again and this time it came to me…I think my grandparents are buried here. We pulled into the main entrance on the left and stopped at the immediate fork in the road. Left or right? As we slowly rolled down the hill to the left we continued our debate as we studied the stones, reading the names aloud. With each turn down the next tiny empty cemetery road the debate inside me grew more complex. My mind diverged; feeling increasingly uncomfortable with my surroundings and equally excited at the prospect of finding my grandparents grave. As we began the loop back to the entrance driving up the last road at the edge of the cemetery I knew this was it. 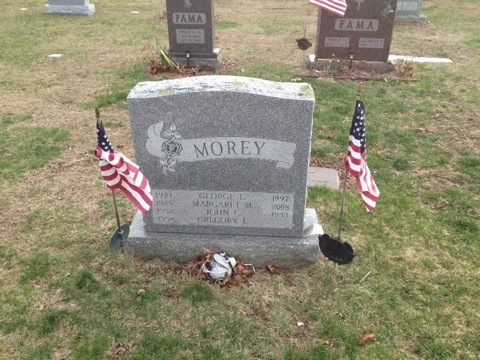 We got out of the car and walked right to the headstone “MOREY” with four plots: my grandfather, grandmother, my uncle John who died in his 30’s and a spot for my uncle Greg (who has Downs Syndrome) who someday –far in the distance, will also be buried here. As we stood over their grave I couldn’t help but feel some sense of accomplishment, some sense of honor and pride sharing this moment and space with Ashley and Joe. Our debate roared on and Ashley pointed out the old gnarled trees and the chirping birds chasing each other along the fresh spring grass. A peaceful nature surrounded us. What better use of the earths land is there? Joe studied the dates on the surrounding stone, noting the age of the deceased trying to build a body of clues to categorize, creating a history from the most basic facts, breathing a story of life into complete strangers we just happened to come upon today. Legacy. I was drawn to a stone two rows down that was shroud in brightly colored Easter eggs and stuffed animals. It was obviously the stone of a child. As I walked toward it I wondered how this child had died. I thought about a mother, father, and sibling sitting over this grave delivering these symbols of life to this spot, a stone, on this earth that was starting to feel less and less lifeless to me. I grew frustrated with the basic facts inscribed on these headstones -name, date, and if your lucky some quote about how precious life is on this earth. I want to know more. I thought about the idea of someone just happening upon Kai’s grave, if he had one, as we did today with this child. I wondered if it would be covered in seasonal toys. I wondered if someone would notice the devastatingly short distance between the dates: 9/5/10-11/27/12. I wondered if they wonder how he died. I felt their pity as I stood over this child’s grave, wondering all of these same things. I wondered if I was wrong about this whole burial thing. Am I somehow denying Kai the opportunity to be discovered, thought about, loved by some chance encounter of stranger walking by? Am I denying him the possibility of some historical recognition, a stable sacred space on this ever changing earth by keeping him selfishly, safely tucked away in my own private shrine?? Maybe, but what if no one comes? What if no one notices? What if I want him back? I can debate this over and over in my head convincing myself that either side is the right thing to do but the truth is, they are both terrible. The thought of Kai being buried amongst a bunch of strangers in a place that I can not reach over and touch any time I want still seems impossibly final to me still. For now Kai’s remains remain with me right where he belongs. I am undergoing a very similar debate with myself about my Eva girl these past weeks. Your post is timely for me. Eva is still on my shelf but I feel the time coming where there will be change.